In the one characteristic which the Arizona Coyotes’ management demanded among themselves, during this past off-season, was the need for speed, speed and more speed. After the dismal season of year ago, the team seemed to skate in sand, and the need for greater puck movement and team speed was obvious. When general manager Don Maloney traded for Anthony Duclair and waited for Max Domi to learn his trade at the junior hockey level, the protracted time window seemed an eternity. The anticipation clearly paid off Thursday night in the Gila River Arena. That’s where Domi and Duclair played their best game as line mates, and created what coach Dave Tippett “the entertainment factor.” The result was a 6-3 victory over the Dallas Stars before 11,853. The win was the second straight in which the Coyotes scored six goals and that’s 12 in their last two contests. The last time the Coyotes scored six goals in back-to-back goals was in Dec., 2005. More importantly, the team came from behind at 1-0 and 2-1 to pick up two significant standings points. The Coyotes now stand at 60 points, four points behind Nashville and Colorado for the final two Western Conference playoff spots. The line of Martin Hanzal at center with Domi on the left wing and Duclair on the right side produced 9-points, and Duclair picked up three assists, his second 3-point night of the season. 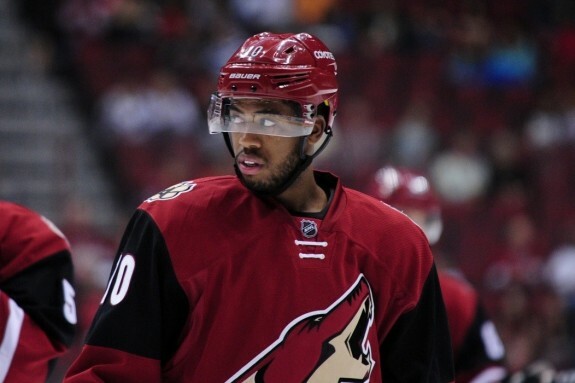 Previously, Duclair picked up three goals against the Ducks at Anaheim on Oct. 14. While the dominant speed and acumen on the ice of Domi and Duclair emerged together for the truly the first time, the pair have grown to develop a particular bond. As close off the ice as fearless as line mates at the rink, the pair seems to develop the needed hockey sense of anticipation and expectation. While Domi wants to focus on the team and lauds captain Shane Doan for challenging his team to raise its’ level of play, here in the final 20 games of the season, his skill set is pronounced. With a 2-goal effort against Dallas, Domi turned his first tally into a highlight reel. Trailing 1-0 early in the second period, Domi flew around the Stars’ defense, down the left wing, and took Duclair’s pass in perfect stride. Zooming in on net, he adroitly shifted to the back-hand and drove the puck under the cross bar to knot the score. Later in the middle frame, he accelerated again off a pass from Duclair to beat Stars’ net minder Antti Niemi at 18:26 give the Coyotes a 3-2 lead and an advantage they did not relinquish. With his 15th goal for the season late in the second period, Domi is now tied for third among all NHL rookies in points. He also leads the Coyotes in multi-point games this season with 10. His 3-point game, two goals and an assist, now gives Domi 39 points on the season, and tied with Keith Ballard (2005-06) and Trevor Letowki (1999-2000) for second most single season rookie points in franchise history. Domi, for one, responded to Doan’s call to raise the level of the bar. The message from the captain, before the Dallas game, was loud and clear. With a lead at 4-2, the Coyotes were clearly aware of the Stars’ capabilities. Coming into the game, Dallas led the NHL in goals scored, and by the end of the game, Tyler Seguin (31) and Jamie Benn (30) were the only players from the same team with two 30-goal scorers. Seguin scored an even-handed goal while Benn lit the red light with a power play tally. Though out-shot 17-8 in the final period, the Coyotes were able to hold off a lethal offense. That gave the Coyotes four points in their last two games, winner in three of their last four contests, and needed bolt of confidence. With Duclair’s three points, Domi’s two goals and the first NHL goal by Tyler Gaudet, the Coyotes’ rookies now lead the NHL in scoring points by rookies. After the Dallas game, they have scored 41 goals for 101 points. Next, the St. Louis Blues skate into the desert and stand right behind Dallas in the Central Division standings. The Coyotes need to continue their production in this one, because they play nine of their next 11 games on the road. After the Blues game, they hit the road for contests in Washington, Tampa Bay, Florida, Philadelphia and Pittsburgh, have two at home and then back on the plane for a four-game road trip.